For 13 years and running LiveWatch has protected over 200,000 families from intruders in every state in the nation. Stationed in their headquarters in St. Marys, Kansas and their offices in Evanston, Illinois, this company provides security by updating industry standards through adapting and adopting modern networking technology. Layers of fail-safes and advanced monitoring keeps you in control with LiveWatch watching your back. Once upon a time, an intruder simply had to cut the power or phone line to your your home to deactivate your alarm system. LiveWatch bypasses this easily by incorporating wireless technology into their sensors and main hub so that it can send signals through several cellular networks and the internet to make sure everyone is notified when it detects any activity. You are in constant control thanks to the smartphone panel and these layers of failsafes. What Makes LiveWatch Security Unique? Many other companies keep you as their customer by locking you into lengthy contracts chock full of hidden fees and penalties for everything. LiveWatch is the opposite. They keep customers around by providing superior service with every detail out in the open. Trust, transparency, and safety is extended to your money as well as your home. Business with LiveWatch is straightforward and simple. To gain access to the essentials of LiveWatchís offerings, you will pay only $19.95. This includes 24/7 monitoring, rapid notification resolution and response, and secure wireless capability. For $29.95 you can enable the smartphone application and protection for your main panel, which prevents the possibility of any ìinside jobs.î For $39.95, home automation becomes possible, allowing you to create a sophisticated set of timers to control every sensor, camera, and even your thermostat to match your daily routine. With the full plan, youíll never have to wonder if you enabled the alarm system or not. Very few companies can boast a 4.9 star rating out of 5 averaged out on over a 1000 reviews. Nor can they say they have been praised by the top publications and consumer agencies<. But LiveWatch has achieved this thanks to their superior product and customer service. Whether you have a common question or an urgent matter, you can find what you need on their website. Search the FAQís in the knowledgebase, live chat with a customer representative, submit a help request ticket, or pick up the phone and give them a call for an immediate answer. You wonít be left waiting with LiveWatch. For state of the art wireless technology and progressive business practices, there is only one option. Customers and professional agencies agree that LiveWatch is the leader of the industry. Know your home is safe by enjoying the layers of constant monitoring through cellular networks and the internet, and control everything no matter where you are with the smartphone app and home automation options. Your home and your loved ones will rest easy knowing you signed up for LiveWatch. Thank you for reading our LiveWatch Security reviews. I thought LiveWatch was going to be a lot more complex to setup. On one hand, I am not the type to go the DIY installation route but I am also not the type to overpay for someone as simple as a home security system. I am smart with my money and try to do the most to practice good money habits. I read about LiveWatch online and decided to see if the reviews further explained the installation process. Everyone said how easy it was, so I figured it must be simple enough and decided to buy it. When it arrived I opened the box and read the directions and had the system running within the afternoon. It seriously took me about 30 minutes at the most and that’s coming from someone with limited DIY installation experience. I like that you can add other motion sensors later down the road if you feel the need, which we do. We will be adding two more motion sensors. One is for the side door and the other is for a low bay window that is at the back of the house. It is an entry point for sure and to further protect ourselves we want to make sure all of these vulnerable points are covered. I know LiveWatch has a lot of strong reviews online and there’s a reason for that. 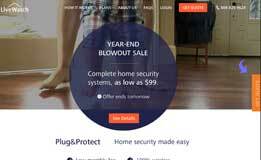 This is a home security system that has everything you need in one affordable bundle. That is my favorite thing for any product. LiveWatch is the real deal! Stop searching for a better home security system because LiveWatch offers all of the features you need and it is a very good price. I am on a strict budget as a senior citizen and LiveWatch is the only alarm I can afford comfortably but it is an exceptional product. I didn’t understand how self-installation worked for a home security system. It could be because I always had those expensive systems a “professional” came out to install the alarm system and attempt to show us the various ways it works. It was always confusing and annoying to do, but it did give us peace of mind so we dealt with it. With LiveWatch I installed the alarm myself within an hour! It didn’t even take me an afternoon, which is what I’d allotted for installation. I give LiveWatch an A+ for anyone who wants to protect their family without the high monthly cost. There are so many home security systems to choose from but I love that LiveWatch lets me watch my house while we’re away. We both travel for work frequently and LiveWatch puts us front and center on the status of our home’s safety. I think LiveWatch is the best home security system we’ve used. I like that it isn’t over the top in terms of abilities. It really provides you with what you need to offer peace of mind and nothing overly complicated. With so many types of security systems on the market today, it’s almost impossible to find the right one. With LiveWatch security system I not only feel like I’m protected but it’s also nice that it’s reasonably priced and affordable! The LiveWatch security system really makes me feel safe and comfortable. Whether I’m in my home or away from it, I know that it is being protected from possible intruders. The system really provides me with peace of mind. I bought LiveWatch Security because I knew we needed a new home security system when we moved. No more of the high monthly fees. LiveWatch Security does what we need it to – sound if there’s an intruder. That’s enough for me! LiveWatch Security was mentioned on a famous radio show when they were discussing how to save money in different areas of the home. I’d never considered a home security system, but LiveWatch Security sounded like a good way to add this protection to my home. LiveWatch is simple to install. It honestly took me about 35 minutes from start to finish and I am a perfectionist. I know this is the only home security system I will use in the future for any other home. The other plus is you can take it with you to another house! Tell me what other alarm lets you do that. So happy with LiveWatch Security. My dad bought it for me when I moved to another city and we installed it together which took no time at all. I feel much safer and I like that I can watch my entry way on my phone with this home security system.